As MSNBC continues its obvious attempts to draw conservatives away from Fox News, Morning Joe co-hosts Joe Scarborough and Mika Brzezinski have fully embraced their roles as the Rush Limbaugh and Sarah Palin of the network. Scarborough even went so far as to insinuate that SAE became familiar with the n-word through hip-hop—as opposed to, say, the generations of redneck ratchetry passed down to them through their Confederacy-loving brotherhood. But it was Brzezinski—with her snide comments about Waka Flocka’s music and side eyes at his stage name—who was given the role of bigot-in-residence, and it has been left to her to clean up the mess. Oh, now it’s a different conversation? Now it’s fascinating? What a difference a day makes when black viewership is on the line. No, Brzezinski did not blame hip-hop for the ease with which SAE members sang that song, nor for some white people’s casual use of the n-word in general. Scarborough and guest Bill Kristol, however, did. And she should be embarrassed that she’s ducking and dodging that issue on their behalf. Bill O’Reilly must be so proud. There is speech, moving one’s mouth to form words, and there is language, a “symbolic, rule-governed system used to convey a message.” And the speech on that frat bus, the juvenile use of the word “n—ger,” is of much less concern than the language that the Morning Joe panel is trying to minimize. The joy, the smug superiority, the frenzied, good-ole’-boy excitement of being among other white people who get it, who find humor in nooses squeezing the life from another human being—that is the language of racialized, state-sanctioned terrorism that taunts black America in 2015 as much as it did in 1856, when SAE was founded. So, trying to shift the blame to a culture born from that terror, a culture that exposes and at times reflects white supremacy, instead of keeping it squarely at the feet of privileged little white frat boys—and the antebellum Southern system that spawned them—is what’s disgusting here. Black people: Stop teaching white people to hate you. 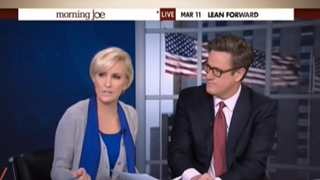 Hip-hop isn’t the system of oppression that the Morning Joe panel needs to dismantle. The thugs of Sigma Alpha Epsilon are just the rotten fruit of trees stained with the blood of black people who built this country on their backs. And let’s be clear: When their white ancestors were holding lynching parties and hanging us from trees, they weren’t bumping Biggie.